Before sunrise most of the Sandhill cranes roosting in the man made lake begin walking east-north, toward their destination and slightly into the wind. They leave the sanctuary of the water and fly out to the planted corn and alfalfa fields of Bosque to eat during the day. These four Sandhill cranes are headed north for the corn fields. Most of the time Sandhill cranes live in family groups; two adults and one offspring. During migration and winter unrelated birds band together in what is known as "survival groups" of 4-10. They watch out for each other. Sandhill cranes mate for life, choosing their partners based on how well they can dance literally. They stretch out their wings, jump up and down, beat their wings slowly and grab grass or other debris on the ground and toss it into the air. You can see this behavior at Bosque in the winter. It's a really special place for the birds (and humans). Love the silhouette look of the in-flight trio of birds flying in unison.......proof that "three is sometimes NOT a crowd - :)! What an amazing capture. I love that the Cranes are in flight and silhouetted against that wonderful sky! This is excellent! 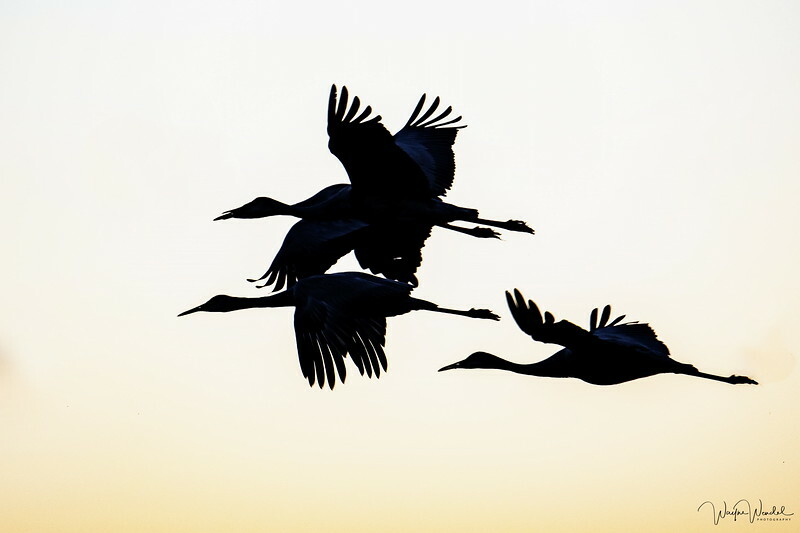 I love the silhouettes of the cranes, each with its wings in a different position in flight. The Bosque is such a special place--now I'm yearning to get back there...it's been several years.